Spend an unforgettable evening! Come to watch the shows on offer by the Krizik Fountain. Often referred to as the dancing fountain or musical fountain, this show of water, light and music, simply must be seen. 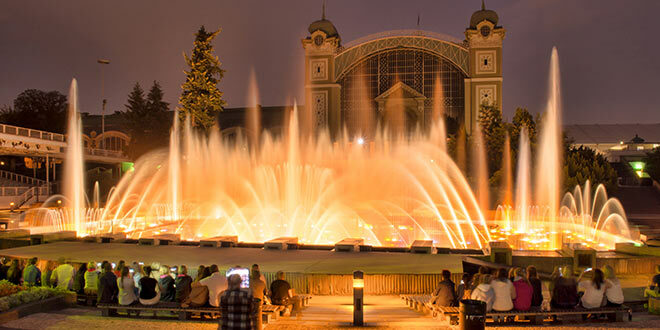 Krizik Fountain attracts large groups of tourists, especially in the summer months, with four nightly shows. It is quite unique and there is no other similar fountain show in the world. This unique structure was built in 1891 for the occasion of the Jubilee Exhibition near Prague’s trade fair area, behind the well-known historical metal building. Its lighting was created by the Czech inventor, Frantisek Krizik, from whom it took its name. It was restored in 1990 and is now operated during the summer months for evening shows with modern or classical music or ballets. There is a big amphitheatre that can easily accommodate 6,000 visitors. The Krizik Fountain works using 3,000 incredible water jets, 50 water pumps and 1,200 lights of all colours hidden underneath its big water basin. Let this incredible water show, the lighting effects and the wonderful music enchant you, all combined in a charming and intriguing show. You will experience unforgettable moments with the best musical and movie melodies or with Dvorak’s, Smetana’s and Vivaldi’s music. The weekly programme often features Romeo and Juliet, Swan Lake and Carmen and even Metalica. Wonderful dancers perform on the huge stage directly in the centre of the great fountain. Getting there: take line C and get off at Nadrazi Holešovice stop, then take the tram no.1, 12, 15 or 25; get off at the next stop at Výstaviště, or go directly by tram. is the fountain active in september? Is it possible to know the program on the next august 26 ? Hi I will be arriving prague on 5 th July and would like to view this show.. which would be best show timing to watch n m staying @ Best western hotel Moran .. so,please lemme know how do I reach there by public transport n do I get transport back to my hotel at late night .? How far is it from my hotel? Does the show happen in november ? No, the Krizikova Fontanta show is held only in the summer months. The blurb says: Wonderful dancers perform on the huge stage directly in the centre of the great fountain. Not when we wnet on 3/4/11 at 8:00 p.m. they didn’t. The music was wonderful – Dvorak’s Slavonic Dances . The waters are fun . But the only dancers as opposed to those advertised on the Fountain website- were only projections. Good but not great entertainment but not as advertised . Can you tell me how much for one adult please? Ordinary tickets costs 200 CZK, there are no discounts available for students etc. Children up to 6 yrs – free of charge. Tickets for selected shows might be a bit more expansive. Booking is not necessary, just turn up 15 minutes before show. Tickets are available on the spot and also from TicketPro or from Orfeus organizing agency.